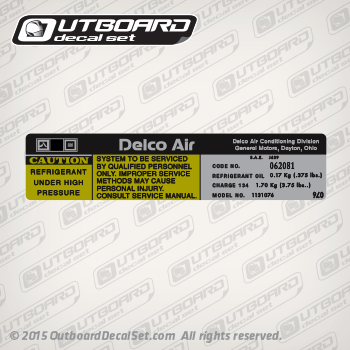 Delco Air Compressor Sticker (5 1/2"X 1 1/4" inches) sold by Each for your Car, This reproduction decal is printed with cast vinyl, UV protected inks and laminated to be resistant to gas, oil or any corrosive fluids that may hurt the print. heat resistant is been evaluated. Code number: 062081. Charge: 134.